This post refers to Progenesis LC-MS, which has since been superseded by Progenesis QI for proteomics. All of the information described, however, remains relevant. A fuller description of the new product can be found here. The Progenesis Post-Processor (PPP) provides a simple piece of software to use alongside your copy of Progenesis LC-MS. TIP: To run the PPP you need to make sure you have installed Java. All that the group who developed the toolkit ask is, if you use it, cite the following reference. D. Qi, P. Brownridge, D. Xia, K. Mackay, F. F. Gonzalez-Galarza, J. Kenyani, V. Harman, R. J. Beynon and A. R. Jones. A software toolkit and interface for performing stable isotope and top3 quantification using Progenesis LC-MS. OMICS: A Journal of Integrative Biology, 16(10), 2012(in press). The publication gives examples of analysis including an S. cerevisiae SILAC test sample, absolute quantification using Sigma48 UPS proteins of varying concentrations 0.25-20 fmol/uL spiked into a yeast culture and exporting data as standardised mzQuantML output. 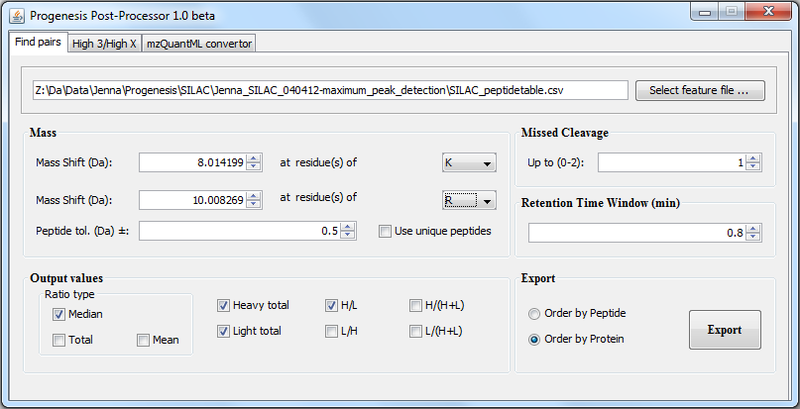 Use the guided workflow of Progenesis LC-MS to generate results and in the Review Proteins view export the peptide measurements as a .csv file. 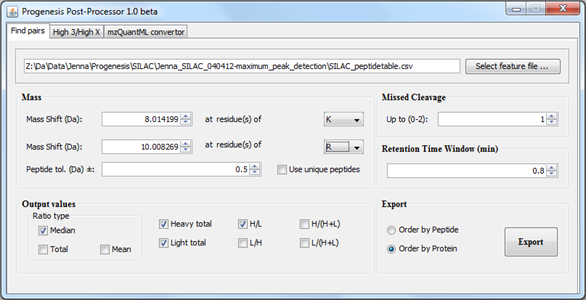 The mzQuantML conversion can use an exported .csv file of peptide or protein measurements. Open the Progenesis Post-Processor and select the data processing you want from one of the three separate task tabs, applying any parameters you need. You are promoted to save the processed results as a .csv for review or to easily incorporate them into any downstream bioinformatics workflow. The PPP, as of 15th August, is a v1.0 Beta. So if you come across any issues or have any feature requests you can post them here to help in developing future versions. Get in touch or download a free trial copy of Progenesis LC-MS to start using the workflow and see the results from your own data. This entry was written by Paddy Lavery, posted on August 15, 2012 at 3:45 am, filed under August 2012 and tagged Progenesis LC-MS. Bookmark the permalink. Follow any comments here with the RSS feed for this post. Post a comment or leave a trackback: Trackback URL. Can you provide me with your raw data and analyzed LCMS project files? I will contact you separately by email to discuss what files you need and how we can best arrange to get any raw data to you. Some raw data is very large and may need us to arrange a sharefile link to be able to transfer it.